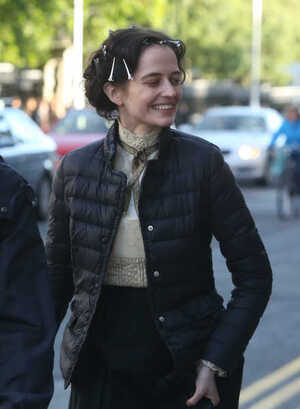 Her Vesperness Eva Green (top left with unidentified crew member and above) filming Penny Dreadful in Dublin wearing traditional Victorian puffa jacket garb. Posted in Misc and tagged Eva Green, she is among us at 11:17 am on September 16, 2015 by Broadsheet. I’m not mad about the series, but she is phenomenal in it. Astonishing actress. Think it’s a ‘sleb’ Frilly. Penny Dreadful. A Bond girl in a former life. And very, very gorgeous imho. Iv honestly never heard of penny dreadful. But now you say bond girl i remember her. Some of the ‘city’ scenes are shot in Dublin. The best of which I’ve seen or that’s caught my eye were of the narrow lane running behind the old Gas Building on Dublin’s D’Olier Street and of the lane that runs down by The Stag’s Head, as well as inside The Stag’s Head. Have you watched Grimm Clampers? That’s not bad. No such thing as a Grimm Clampers. If you’re happy and you know, clamp you hands! Yes, I recommend everyone watches the film The Dreamers. Couldn’t tell you what its about but Eva rarely has clothes on in the film. Just googled Eva Green, crickey o’reily sweet Miley and Dinny! She has been in things! While wearing not a lot of things. Also, I’m really enjoying the ignoring of Star Wars. Wonder if it was being filmed on an island off Dublin this place would be full of da wars? It’s be easier to get to and Photograph, anyway. In fact anywhere that isn’t the skelligs would be mobbed. I went for a walk on a winters day! One of the best actresses from a non-English speaking country to master an English accent.